If you missed my interview with Marie Lu about The Young Elites, click here to read it! When Adelina was a child, she survived the blood fever that ravaged her country. She was physically marked and now a teenager she is known as a malfetto and is unwanted. Some malfettos possess special powers, making them one of the Young Elites but Adelina is not one of them…at least, that’s what she thinks until one night she runs away from home and her powers are unleashed in a horrible accident. Now on the run, Adelina is taken in by the Young Elites and trained to become one of them, if only she can control her vengeful urges. Spun as a villain origin story, The Young Elites explores Adelina’s descent into darkness when dangerous powers awaken in her and she must navigate between those who want her dead and those who mistrust her. The fantasy world is heavily influenced by Renaissance Italy, with all of its decadence, providing an interesting context for the story. The chapters alternate between Adelina’s perspective and the points of view of other characters who are on shifting sides of the conflict between Young Elites and those who wish them dead. It’s unclear who the hero of this world will be, or if one will even emerge, but there is no shortage of interesting characters and the tension between them keeps the plot moving. 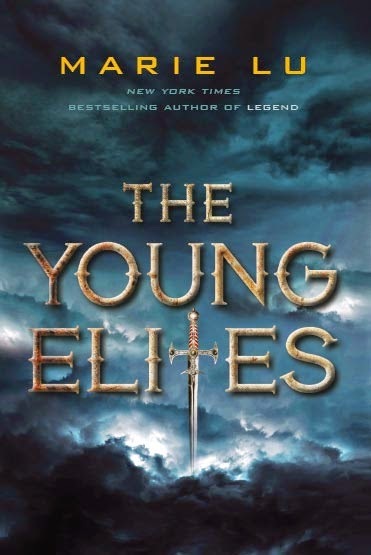 The Young Elites is an interesting new addition to YA fantasy. Cover Comments: I like the way the dagger is used in the font and I think the stormy sky is really atmospheric, although this cover isn't really all that exciting otherwise. ARC provided by publisher. The Young Elites will be out on October 7th! I loved this book so much I read it in under 12 hours. This book is one that I suggest to anyone in high school or above. I cannot see why this is not the new Hunger Games. I found this story to be even better than champion, Marie Lu top novel. A MUST READ!